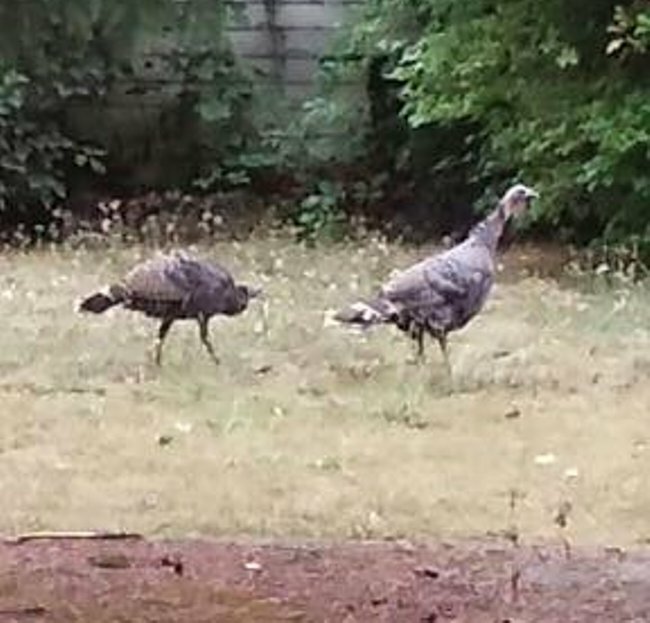 Two turkeys moved to our street recently. 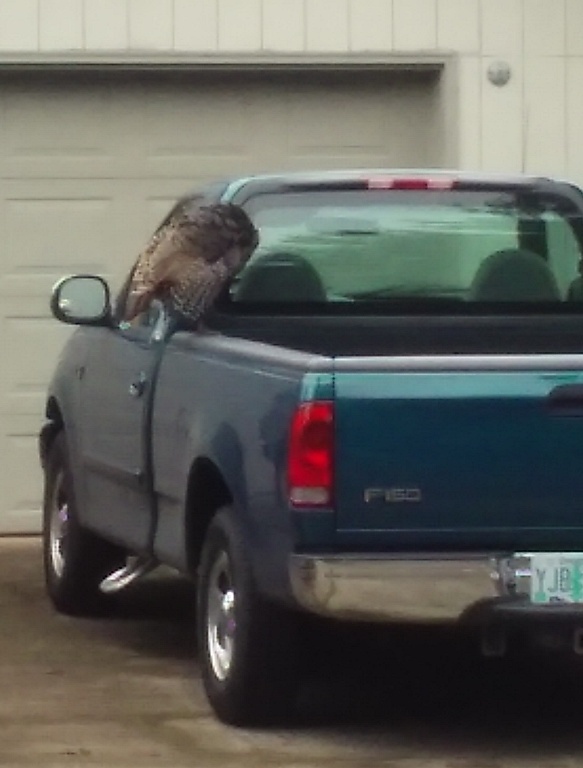 I’m not talking about nefarious neighbors with questionable pasts, I mean the oversized bird—guts, feathers, and all. I first noticed them in August, strutting side by side down the sidewalk toward the park where our street ends. Nothing unusual about that—ducks and geese regularly visit the playground looking for leftovers from careless picnickers. This eager pair probably hoped to share in the bounty. After that first sighting, the birds disappeared. My sister, who lives twenty-five miles to the north, regularly entertains wild turkeys on her country property. She’s named the gobbler, Major, and his sidekick, Sarge, because they stand sentry over their hens like a fort guard. Her dogs have made the mistake of messing with Major when he’s in protective mode and have been chased across the field as if running from a tank, yelping their fear for all the world to witness. This past week, the turkeys on our block returned, wandering from one yard to the next, sampling the bushes growing at the fence line and leaving their fowl calling cards in a trademark plop of “foul” along the cement. 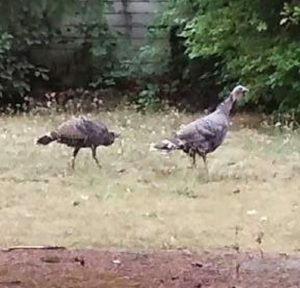 With Thanksgiving so near, I wondered if they were aware of the holiday and the dangers that may lurk near them as they saunter along the street. If this were 1860, my great-grandfather would have them already sighted with his gun, the cook stove heated, a large crock of hot water waiting to help remove their feathers. My son asked me if I wanted one of the hens for the holiday. I declined, not knowing if wild birds are fair game in the city. I know God’s word teaches us to give thanks for everything. “Every good gift and every perfect gift is from above, and cometh down from the Father of lights, with whom is no variableness, neither shadow of turning.” James 1:17. I don’t want to seem ungrateful, but somehow lifting a frozen turkey from a grocery store’s freezer and cooking it seems far less personal than carving the bird you watched eat your petunias. It’d be difficult to swallow. Love your humor and personal connection to these gobblers!